Big development plans are taking shape for the area surrounding the Forest Park-DeBaliviere Transit Center that will further bolster a live, work, play atmosphere in the heart of St. Louis. Pearl Real Estate Companies has put forth a proposal that includes three separate buildings that would transform Metro Transit’s former passenger drop-off area and Park-Ride lot, as well as the retail property north of the transit center. At its November 16 meeting, the Bi-State Development Board of Commissioners approved proceeding with the project conditioned upon the developer securing all the needed approvals, including from the City of St. Louis, surrounding neighborhoods and the Federal Transit Administration. The development includes 265 residential units, 33,888 square feet of ground-floor retail, streetscape and public space improvements, and up to 342 parking spaces. 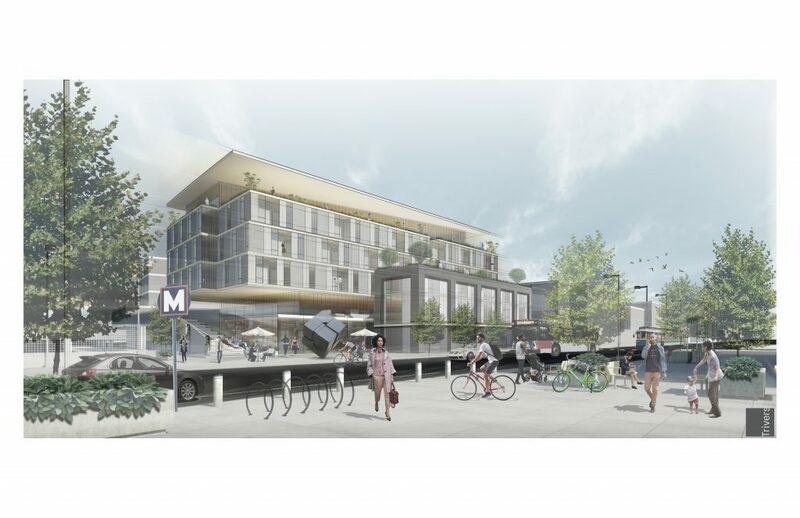 The Metro Transit Park-Ride lot will include a six-story building with 108 apartments, and nearly 13,000 square feet of ground floor retail. There will be streetscape and pedestrian amenities, including public art. The former passenger drop-off area will be the location of a five-story building with 51 apartments and 5,000 square feet of ground floor retail. Finally, the retail center north of the Metro Park-Ride lot will have a four-story development with 106 apartments and 16,000 square feet of ground floor retail. The design of this project is focused on the transit center and the multi-modal assets of this area in order to bring an attractive, vibrant development that the neighborhood, transit riders, and visitors to the area will enjoy. Jeff Tegethoff, principal with Pearl Real Estate Companies, said the project will help foster a car-optional lifestyle. The developer is targeting starting work near the end of 2019 with completion by the end of 2020. Will the existing ML station remain or will it disappear? The Forest Park-DeBaliviere MetroLink will remain and be in operation – the close connection between transit and the new retail/residential spaces is one of the benefits of the new development. Transit Oriented Development is rocking and rolling. For all those who want to work the big machines that will be building this place, some words of safety for doing so. No smoking while on site, no spacing out to what is around the machine while it’s running, and all excavator operators should wear their seatbelts. The reason why I say no smoking is that if you have a cigarette going and you thump a hot cigarette ash and it hits something flammable, you can set off an explosion and have a ton of neighbors land on you big time. Spacing out to other things while the machine is running is also dangerous. Full attention to the machine is much safer due to that you can quickly stop the machine if you spot it doing something you don’t want it to do. Is there a new meeting concerning this proposed work on Tuesday, November 27? What organization are you referring to Vince?